at-ten-tion! Give it to me! Did I mention that the title of the Make You Notice exhibition I’m in comes from the lyrics to the Pretenders’ “Brass In Pocket“? So there’s more talking to be done: Curator Patricia Maloney invited me to be part of another discussion associated with Make You Notice: how could I turn down (probably) the only opportunity I’ll have in my life to be on a panel with roller derby women, queer burlesque artists, and hard-core knitters? (And for that matter, how could you turn down an opportunity to attend such a panel?) This Friday! SF. Be there. 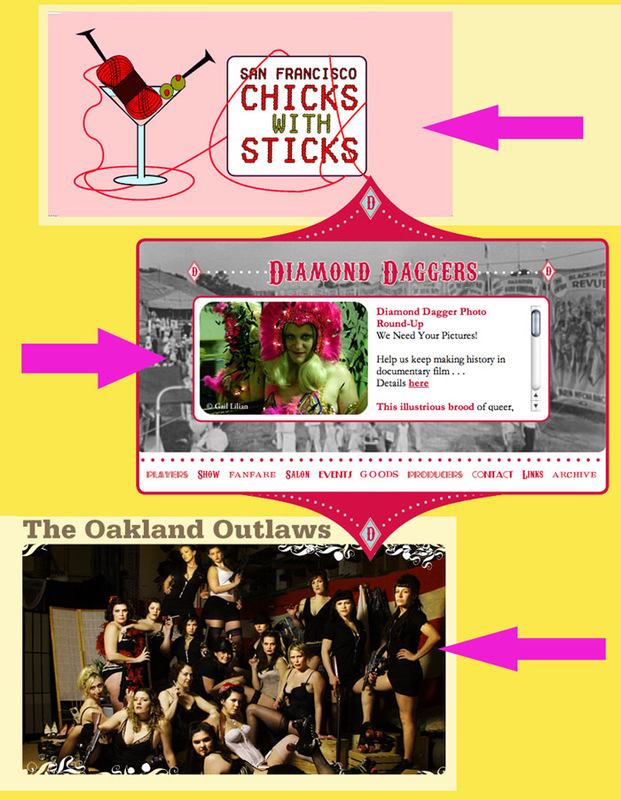 The San Francisco Arts Commission Gallery is pleased to present an evening of inspired conversation about Make You Notice, roller derby, queer burlesque, and knitting circles, featuring the Oakland Outlaws, the Diamond Daggers, Chicks with Sticks, and more. This special event is in association with Make You Notice, an exhibition at the SFAC Gallery curated by Patricia Maloney. Make You Notice features video, photography and ephemera by four contemporary women artists who utilize performance in diverse practices, seamlessly integrating collaboration, activism, irony, and optimism into their work. This entry was posted on Sunday, April 20th, 2008 at 9:13 pm	and is filed under -. You can follow any responses to this entry through the RSS 2.0 feed. You can skip to the end and leave a response. Pinging is currently not allowed. yeah, dude. who WOULD resist such an offer! awesomeness. i hope it was a total hot mess. in a good way!